With indirect heat, the fire is off to on side of the grill, or on both sides of the grill, and the food sits over the unlit part. Direct heat works great for smaller, tender pieces of food that cook quickly, such as hamburgers, steaks, chops, boneless chicken pieces, fish fillets, shellfish, and sliced vegetables. It sears the surfaces of these foods, developing flavors, texture, and delicious caramelization while it also cooks the food all the way to the center. Indirect heat works better for larger, tougher foods that require longer cooking times, such as roasts, whole chickens, and ribs. It is also the right method for finishing thicker foods or bone-in cuts that have been seared or browned first over direct heat. A direct fire creates both radiant heat and conductive heat. Radiant heat from the coals quickly cooks the surface of the food closest to it. At the same time, the fire heats the cooking grate rods, which conducts heat directly to the surface of the food and creates those unmistakably and lovely grill marks. If the food is off to the side of the fire, or over indirect heat, the radiant heat and the conductive heat are still factors, but they are not as intense. 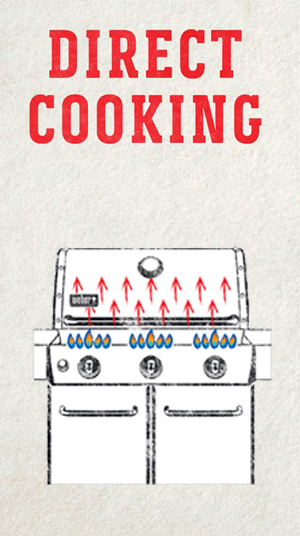 However, if the lid of the grill is closed, as it should be, there is another kind of heat generated: convective heat. It radiates off the coals, bounces off the lid and goes around and around the food. Convection heat doesn't sear the surface of the food the way radiant and conductive heat do. It cooks it more gently all the way to the center, like the heat in an oven, which allows you to cook roasts, whole birds, and other large foods to the center without burning them. The world of the charcoal grill is essentially back to basics – returning to the original experience of cooking over an open fire. Take your time to light the grill, focus on the details, practice controlling the temperature, and enjoy the process as the food cooks. EVERYDAY HEROES – Who wants to be stuck in the kitchen for hours? Step outside and enjoy the fresh air while cooking a delicious meal on a Weber® gas grill. With a push of a button your grill is lit and a delectable meal is soon to be devoured. The direct method means that food is cooked directly over the prepared coals. This method is used for foods that take less than 25 minutes to cook. Open the lid and place it on the rim of the grill using the hook inside the lid or in the Tuck-Away lid holder depending on the grill model. Remove the cooking grate and set aside. Open the bottom vent using the handle underneath the bowl. Place two lighter cubes on the charcoal grate and then place a Chimney Starter oer the lighter cubes. If you do not have lighter cubes, soak some newspaper with olive oil, wad it up and place under the Chimney Starter and ignite through the holes in the bottom. Fill the upper chamber of the Chimney Starter with briquettes, lift up the Chimney Starter, and light the cubes or newspaper. Weber briquettes will take 15 to 20 minsutes to light fully. When the charcoal is lightly coated all over with white ash, it is ready to go. 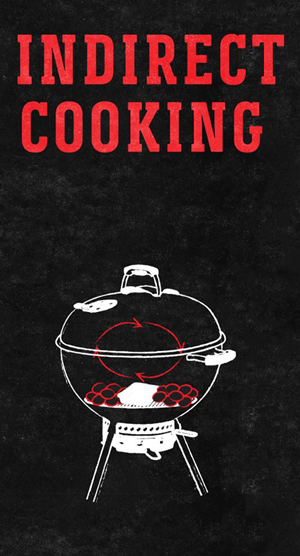 Put on two protective barbecue mitts and carefully empty the coals onto the charcoal grate. Spread the coals, using a charcoal rake, in a tightly packed, single layer acrooss one-half to two-thirds of the charcoal grate. Put the cooking grate in place, close the lid, open the top vent, and leave all the vents open. Let the cooking grate preheat for 15 minutes. Brush the cooking grates with stainless steel grill brush to remove any leftover debris. Place food on the cooking grate. Close the lid on the grill and lift it only to turn the food or to test for doneness at the end of the recommended cooking time. The indirect method means that the heat is placed either to one side or both sides of the food. Use the indirect method for foods that take longer than 25 minutes or are so delicate that the direct exposure to the heat source would dry them out or scorch them. 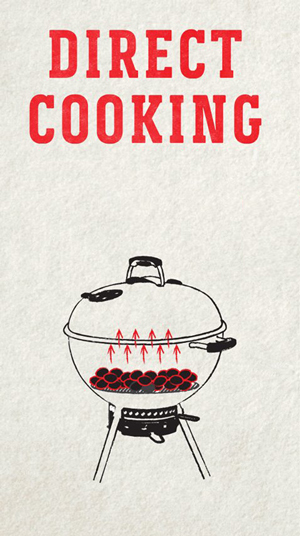 Spread the coals, using a charcoal rake, into two equal piles on opposite sides of the charcoal grate. This gives you two zones for direct heat-high, medium, or low-and one zone between them for indirect heat. For best results, place roasts, poultry or large cuts of meat on a roasting rack set inside a disposable heavy-gauge foil pan. For longer cooking times, add water to the drip pan to keep drippings from burning. The drippings can be used to make gravies or sauces. The direct method means that food is cooked directly over the heat source. Use the direct method for small, tender pieces of food that take less than 20 minutes to cook, such as; hamburgers, steaks, chops, kabobs, boneless chicken pieces, fish fillets, shellfish, and sliced vegetables. 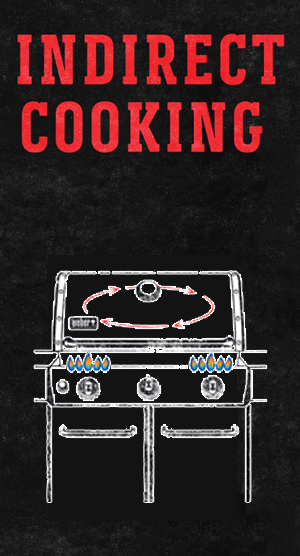 Open the lid of your gass grill and make sure all control knobs are in the off position. Slowly open the valve on your propane tank all the way or turn on the gas at the source and then wait a minute for the gas to travel through the gas line. Light each burner individually, from left to right, following the owners guide instructions of your grill model. Preheat the grill for 15 minutes, or until the grill's thermometer registers 500° to 550°F. Brush the cooking grates with a stainless steel grill brush to remove any leftover debris. Adjust all burners to the temperature noted in the recipe, close the lid, and allow the grill to come to the proper temperature. Place the food on the cooking grate. Close the lid of the grill and lift it only to turn food or to test for doneness at the end of the recommended cooking time. Adjust the burners on each side of the food to the temperature noted in the recipe and turn off the burner(s) directly below where the food will be placed. Close the lid and allow the grill to come to the proper temperature. 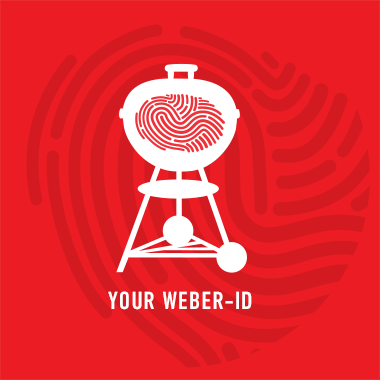 Indirect grilling on the Weber® Q® is possible. We recommend placing your food on a vegetable basket (flipped upside down) or on a roasting shield to best replicate the indirect grilling method. Then grill "low and slow" with the temperature set on low.